Latest developments in the Park from our Ranger, Jennifer Davidson. Squirrels – We had a clean bill of health on the last 10 samples sent off in September 2015 for squirrel pox virus testing. There are no samples being collected at present. Volunteers are managing and monitoring four dual feeder boxes to try and confirm if there are anything other than grey squirrels using them. This round will finish at the end of April 2016. Butterflies – UKBMS transect survey training cannot be delivered by the Ranger Service this year due to lack of staff. Butterfly Conservation are taking on Fallin Bing and Wester Moss. 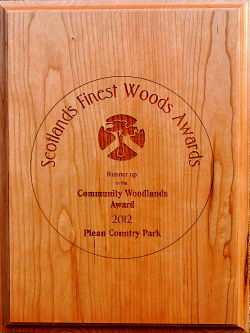 Hopefully some of our experienced survey volunteers can continue this in the Country Park. Survey starts on 1st April. Orchids – The meadows were not cut at all this October due to being at a point in the cycle where they do not require cutting in order to follow the regime informed by the previous 6 years of zone management. The ultimate aim is to get sheep on to graze for a few months in the winter, but this will need considered preparation before going ahead. It would be a cheaper, and more environmentally friendly method of managing these meadows. The maintenance team unblocked the pond to reveal the boardwalk that had been submerged after contractors dug ponds out. Four new picnic benches have been installed – we will be replacing all of them eventually, as and when income can be identified for them. The team are also chipping (literally!) away at the aftermath of all the tree falls, but this will take some time. The grazing field fence on the opposite side of Cadger’s Loan was fixed when fencing contractor added stock fence for the orchard. The tarmac surface has been completed, plus additional and upgraded bollards and disabled parking bays to be installed. A visitor access point has been added in front of the toilet block, with a new notice board, and litter bins to follow. Some surfacing and drainage works to be carried out, plus a new notice board to be added. The fire ponds at the other side of the meadow to have a new, gently graded path added to allow better access for all, taking away the need to negotiate the steeply-stepped slope, or having to go on the horse trail. The horse trail surfacing and drainage will be improved here, too.